An Exclusive Rooftop Dining Experience! Kuala Lumpur is now bombarded with fabulous bars and dining scenes on the city’s skyscraper rooftops… and why not? The city’s night skyline is a sight to behold with the nation’s proud Twin Towers, KL Tower and other impressive skyscrapers. 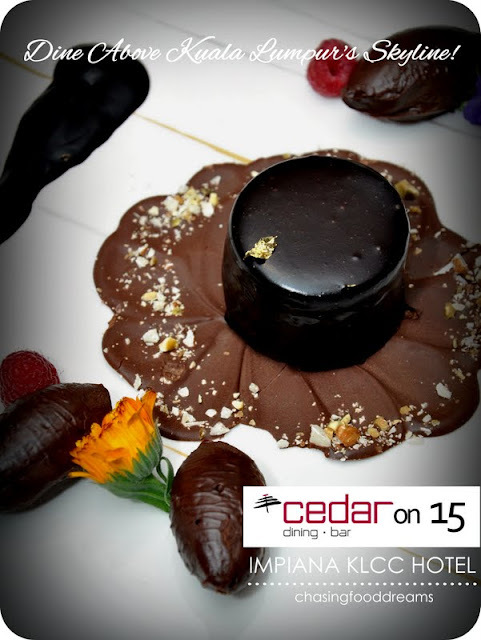 Getting a piece of the cake is the latest addition of CEDAR ON 15 located at the rooftop of Impiana KLCC Hotel in the Golden Triangle of the metropolitan city. The talk of the town right now, CEDAR ON 15, a western restaurant and chill out bar takes form with the concept ‘Fresh, Simple & Chic’ to offer guests an exclusive and unforgettable dining experience and chill out bar coupled with a panoramic view of Kuala Lumpur’s skyline at night. 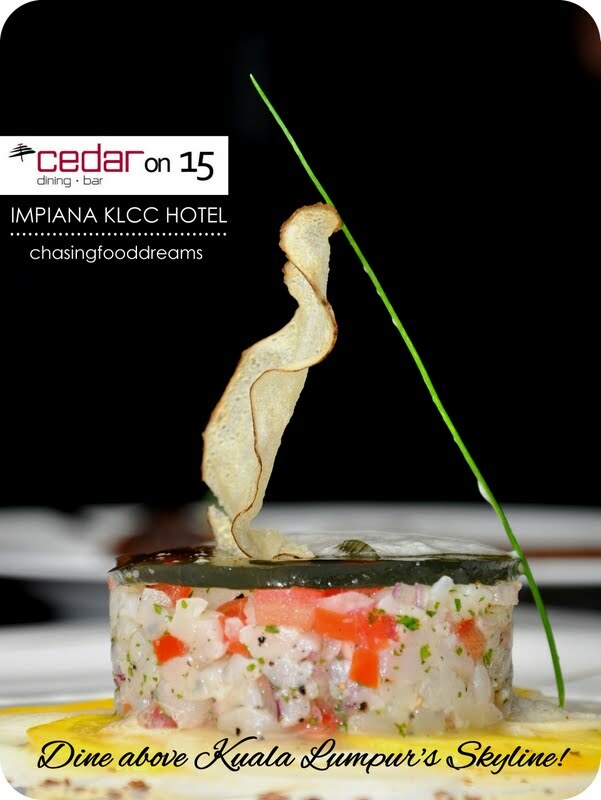 CEDAR ON 15 is tastefully decorated and well-design for chic and comfort in mind. Boldly playing with dark shades of grey, white and red, the restaurant has a contemporary flare in the groovy art light display across the room. 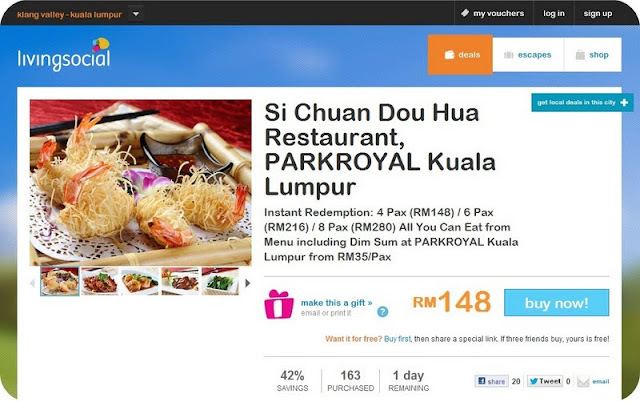 It is certainly designed with romance in the air and yet elegant enough for business functions. This trendily designed restaurant comprises a spacious show kitchen, a private dining room, a U-shaped bar and a serene dining area. Guests are serenade by the house band while enjoying their dinner in the minimal but chic ambience. After dinner, chill out to the female resident DJs’ in the bar area till 2am for some R&R moments while taking in what the city has to offer at night. Helmed by Executive Chef Helmut Lamberger from Rosegg, Austria, the cuisine at CEDAR ON 15 is modern contemporary signatures with touches of European flair. Passionate about his work, Chef Helmut spoke with such desire when ask to describe his signatures. The night started with CEDAR ON 15 amuse bouche of intense smoked salmon mousse enveloped with ultra-thin glass honeydew showing off a balance of salty smoked flavors with crisp sweet melon. Simple but delicious to kick off the evening’s dinner! More commonly known as Jerusalem artichoke, earth apple or sunchoke, topinambour is the tuber of a species of the sunflower. The creamy bisque of the earth apple has a similar texture consistency as potato but taste differently. In fact, I adored the bisque as there is a luscious sweet mellow flavor with much earthiness to it. Served alongside to provide further finesse is crisp dried earth apple chip and grilled meaty slices of portobello mushroom. A very satisfying bisque with refine flavors! A first for me, the opulent black cod is decked with a crust of pumpkin seeds to give it a nutty edge. The fish was excellent in every aspect from its sweet and delicate flavors to the nice golden crust and savory seasoning. Two duxelles of mushroom chutney gave the fish a smoky and tangy touch while the fennel mousse was amazing. Rounding up the sumptuous cod was slow roasted sweet garlic cloves and plump olives. The dish is creative and tasted effortless and delicious. I was indeed seduced! Chocolate Seduction is an ensemble of dark mousse quenelles, white silky ganache and an Austrian signature Sacher Torte from Chef Helmut. While I did enjoy the dense almost crumbly texture of the Viennese chocolate cake with apricot jam, I fell hard for the dark mousse quenelles for its intense cocoa richness. The chocolate affair was further inducted with more chocolate décor and a white chocolate ganache. Dressed up with edible flowers and berries, this is one dessert you certainly want to be seduced by! Tea to complete the evening! Other signatures of Chef Helmut are certainly a sight to behold! Taking us through modern dishes inspired by classics, gourmet connoisseurs would be please with Tartar of Scallops, Beef Carpaccio, Organic Pumpkin Chowder, Australian Greg Norman Wagyu Rib Eye, Malt-Glazed Venison Leg and Short Crust Lemon Tart. Reasons to visit? A fabulous panoramic view of Kuala Lumpur’s skyline at night coupled with a classy and chic ambience while being serenade by CEDAR ON 15’s house band. Let’s not forget Chef Helmut’s eclectic signature dishes with extensive wine and cocktail selections. Chill out to female resident DJs’ mixes to groove to the beat till 2am while enjoying the city’s night scene at the open air rooftop bar lounge. CEDAR ON 15 is definitely set to impress! 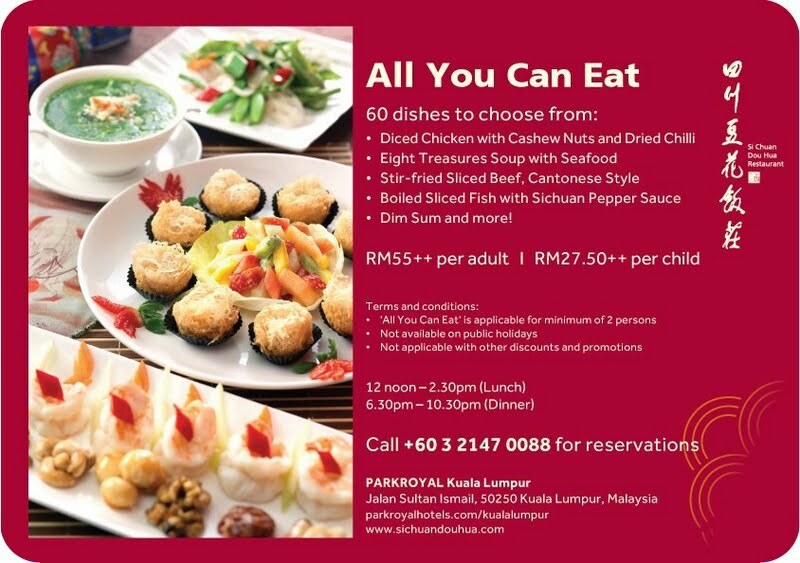 For dining enquiries, promotions and reservation, please call 603 2147 1111, extensions 3711 or 3320.